Russ Kommer is a bright young custom knifemaker who was based in Anchorage, Alaska, for many years. Conditions there are rugged, either from the climate or the work folks are doing. He thought a knife that was easy to grip and hard to lose would be a big hit, and since he made the first Bear Claw, he hasn’t been able to meet the demand. His original concept was a self-defense knife for women that would be lightweight, easy to access and control. But it seems that every parachutist, bush pilot and commercial fisherman who sees one, wants one. 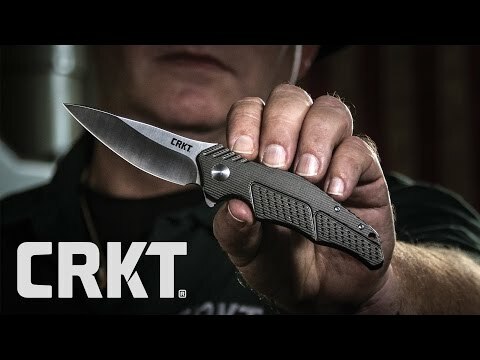 CRKT developed one of their trademark high-tech sheaths for the Bear Claw that’s tough, durable, injection-molded glass filled nylon. It allows efficient quick release of the knife—just thumb push against the sheath to release smoothly and quietly—or give a sharp pull. It features molded-in threaded fittings for attachment of the wide black stainless steel pocket clip at either end, using the Torx tool and screws provided. 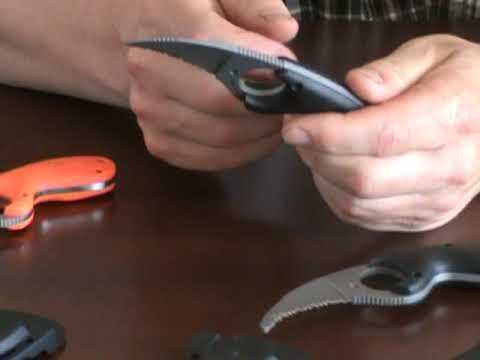 The sheath also has a total of seven lanyard holes and belting slots to permit a variety of carry positions, and a lanyard is provided.